I’ve been sorting through many New Year’s email campaigns, and so far two trends are (expectedly) visible: telling subscribers that everything is X percent off or part of a clear-out sale after the expensive holidays, or trying to tie in with people’s New Year’s resolutions on living a better life. One company that did something different is one that makes cases for devices: see the Otterbox thank you email below. 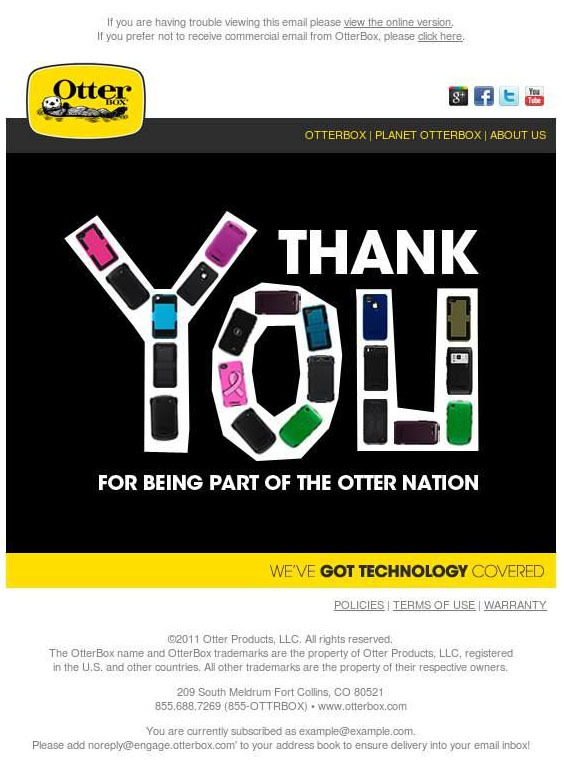 Otterbox uses the closing of 2011 and start of 2012 as an opportunity not to try to sell something, but to thank those who are part of their business. Too few businesses do that in their email marketing messages, while I believe it should really become an honest trend. In the ‘you’ of ‘thank you’ in the email design they’ve incorporated several of the cases they sell, which is a nice touch to the otherwise simple design and message. Sometimes an email marketing message doesn’t really need more than that, does it? They’ve added the social network links, even including Google+: one of the first email marketing messages I’ve seen including a link to that network. All in all, Otterbox is the first email marketing design winner of 2012 – hopefully starting this positive trend towards thanking subscribers & customers. After all, they are the ones that make sure you’re still in business.